When the new Faerie abilities were introduced, everyone was hectic, had tons of questions and was unsure of many things. Word spread quickly and even Neopians who were gone for a while returned. Since there are a variety of faeries, different blessings required and multiple potions to work with, here is a little more information about each of the faeries! I go into detail about each of their roles while training abilities. Before we meet them, though, let me just shortly explain the retired, inactive Fading Faerie Bottles & how they work. These were around Neopia for over a decade until recently when they became retired and power fading. These bottles can no longer grant blessings for your pet; however, you are able to combine these bottles to create a Weak Bottled Faerie at random. Just remember that it does not matter which three faeries you pick, as long as they are different. There are no combinations to creating a certain Weak Bottled Faerie as the result from the cooking pot is random. 1. Mix any three different Fading Bottled Faeries together in the Cooking Pot to receive a random Weak Bottled Faerie (Tier 1). 2. Randomly awarded from winning challengers in The Battledome. 3. Restock at the Magic Shop. 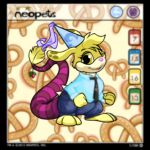 Once you have the faeries, use them to "bless" your specific Neopet. Please remember that Fading Bottled Faeries do not bless your pet anymore. Yes, they do - Any blessings required for an ability learned will be removed from the total amount that you have. Can I use all these abilities or just a certain amount? You are able to use one ability from each Level Tier at a time in battle (which gives you a total of ten different abilities to use at max level).